Who knew that moving in with the new husband would bring up all these design dilemmas, like what to do with all our books. We initially put all the books in his Pottery Barn bookcases, but it looks so generic no matter how artfully we arrange everything. 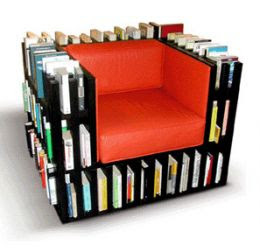 I would love to get me one of these chairs as an alternative to the standard bookcases. This chair from Nobody&Co. would be a great addition to the living room. Why is it that all the really cool furniture seems to come from Italy?